Trailhead and parking area are at the end of Diamond Ledge Road in Sandwich, NH. To get there, take Grove Street from the north side of Rt. 113 in Center Sandwich, 0.1 miles northwest of Rt. 109. In 0.4 miles, the name of the road changes to Diamond Ledge Road. Drive 1.9 miles more, then turn left to stay on Diamond Ledge Road. In another 0.2 miles, bear right at a signed fork and continue 0.4 miles to Mead Base Conservation Center. Mt. Israel, a southwestern extension of the Sandwich Range, provides hikers with impressive close-up views of the higher peaks of that mountain range from extensive ledges around its summit. 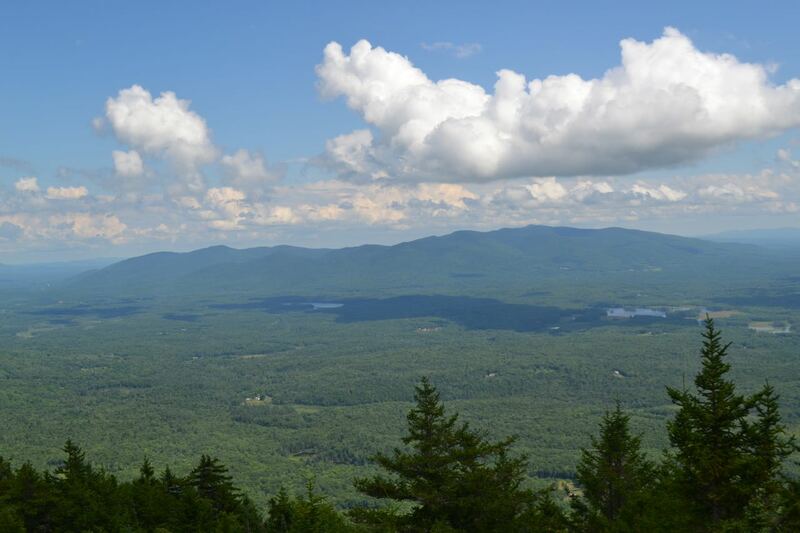 Scattered viewpoints also have good views south to the Lakes Region. The occasionally steep and rough Wentworth Trail leads to the summit. From the parking area at Mead Base, walk to the kiosk and follow the path through the clearing to a sign for Wentworth Trail, where the trail enters the forest and begins a moderate ascent. In 0.3 miles, the trail crosses a stone wall and heads across the slope on the first of many switchbacks. It continues at easy grades, crossing several seasonal streams for another half mile before crossing a larger stream and turning uphill to follow it. The trail soon diverges from the stream and continues angling uphill. After a sharp left turn, the trail steepens and switchbacks become more frequent. The trail continues this way for about half a mile before it reaches the first viewpoint, where there are good views over the trees to the Lakes Region. From here, the trail climbs a very steep and rocky pitch, then levels off as it crests the broad plateau atop Mt. Israel. After a long section of easy walking, the trail emerges on open ledges with restricted views. It then continues over the ledges for an equally long section before dipping back into the forest to join Mead Trail. The summit is just beyond. From the tiny dome of the summit, there are excellent views in two directions. To the left are Stinson Mountain, Mt. Carr, Mt. Kineo, and Mt. Cushman, seen over the Campton Range. To the left of Black Mountain, a spur of Sandwich Dome, is Mt. Moosilauke. Massive Sandwich Dome rises across a valley in front of you. To the right of Sandwich Dome are the two sharp peaks of North and South Tripyramid, with the gentler West and East Sleeper on the ridge to Mt. Whiteface. Below are two Flat Mountains. Behind Mt. Whiteface is Mt. Passaconaway and two of its sub-peaks, Nanamocomuck Peak and Wonalancet Hedgehog, to the right. Further over are the ledgy mound of Mt. Paugus and the sharp pinnacle of Mt. Chocorua. For a better view to the flatlands to the east, step off the northeast side of the summit cone and follow a herd path down through the forest for less than 0.1 miles to a wide, flat ledge area. A more obscure herd path leads a short distance from here to another ledge on the east side with a good view of the Ossipee Mountains.